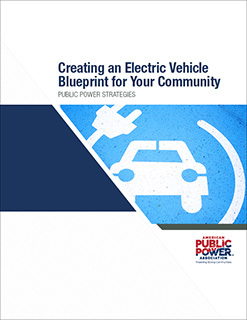 Creating an Electric Vehicle Blueprint for Your Community: Public Power Strategies discusses the growth of the electric vehicle industry and the challenges and opportunities that public power faces from this new load growth. With this publication, you’ll understand how to leverage this technology for your utility and customers. Prior to using this toolkit, you should read the Association’s comprehensive electric vehicle report, A Public Power Guide to Understanding the U.S. Plug-in Electric Vehicle Market. This publication was prepared in 2018 by Patricia Keane of the American Public Power Association.